Using farsighted glasses to counter nearsightedness? Can nearsightedness be just a result of eyes getting accustomed to working at very close distances most of the time? If so, can it be possible to revert that adjustment by wearing anti-corrective glasses to make those short distances seem longer? Can wearing anti-corrective glasses potentially cause any long lasting eyesight damage? I had pretty much perfect eyesight till about 13 years, at which point I started using computers a lot. Since then my eyesight seems to have been degrading slowly, which is probably related. By the age of 18 I had about 1.0 nearsightedness. However, after the following 7 years of university and a very computer-bound job, I think it hasn't even reached 1.5, even though I was using computers much more than before. It's like it degrades just enough to accommodate for regularly staring at a screen, not even half a meter away at times. That made me wonder. Sitting further away from monitors just isn't practical most of the time, even though I can see everything fine from at least twice the usual distance, but what if I started wearing farsighted glasses in front of computer instead? The screen would look like it's further away, so logically my eyes should not have to get used to looking at such close objects. Does it even make sense? Am I missing something? Can trying that hurt my eyesight somehow? It seems like it should work, but I could not find any related info. This answer is not a substitute for medical advice and medical advice questions are off-topic here. If you have concerns about your eyesight you must speak to your optometrist (or ophthalmologist if you are under their treatment). Question 1 - Can nearsightedness be just a result of eyes getting accustomed to working at very close distances most of the time? In people with short-sightedness, the eye has usually grown slightly too long. This means that when you look at distant objects, the light isn't focused directly on to your retina, but a short distance in front of it. Spending a lot of time focusing your eyes on nearby objects, such as reading, writing and possibly using hand-held devices (phones and tablets) and computers can increase your risk of developing short-sightedness. However, myopia cannot be halted permanently. Short-sightedness usually stops getting worse at around the age of 20. There's currently no single treatment available that appears to stop this progression. But it may be slowed by treatments involving eye drops of a medication called atropine, or special contact lenses. As highlighted by the Mayo Clinic, it is a myth that wearing eyeglasses that have the wrong prescription will damage the eyes, but it may make your vision worse and cause other problems such as headaches. Eyeglasses change the light rays that the eye receives. They do not change any part of the eye itself. Wearing glasses that are too strong or otherwise wrong for the eyes cannot harm an adult's, although it might result in a temporary headache. At worse, the glasses will fail to correct vision and make the wearer uncomfortable because of blurriness, but no damage to any part of the eye will result. The use of so called anti-corrective lenses is a topic of discussion in many blogs but I would heed caution on taking advice from blogs. 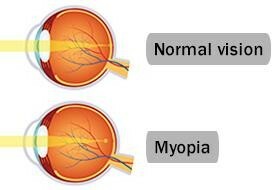 There have been scientific studies on "undercorrection" of myopia in children (Chung, et al. 2002) which found that it enhances rather than inhibits myopia progression. If you use computer screens over a long period each day, especially if you do so as part of your job, wearing the correct prescribed eyewear would be the best thing to do. Employers must provide and pay for eyesight tests and any resulting prescription where requested by the employer in law under the Health and Safety (Display Screen Equipment) Regulations 1992 here in the UK, and in the European Union under Council Directive 90/270/EEC of 29 May 1990. Employers must also ensure that employees take regular and adequate breaks from looking at their screens. This applies whether you work at home, hotdesk at different locations or workstations, or work at a fixed workstation. Not the answer you're looking for? Browse other questions tagged computers optometry glasses myopia-nearsightedness or ask your own question. Can tight glasses cause headaches? Can a small monitor + powerful reading glasses be a substitute for a large monitor with same resolution? Can very tight glasses restrict blood flow to the brain? My left and right eye have a consistent, clear difference in color perception. Why? Is it normal for it to take more than 3 weeks to get used to astigmatism correcting glasses? is a prescription +1.00 diopter lens the same as over-the-counter lens in +1.00 magnifying glasses?